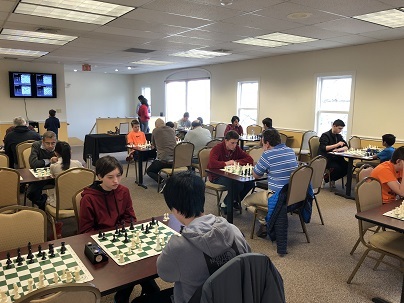 This Saturday's Quads hosted a total of 26 players in six sections. 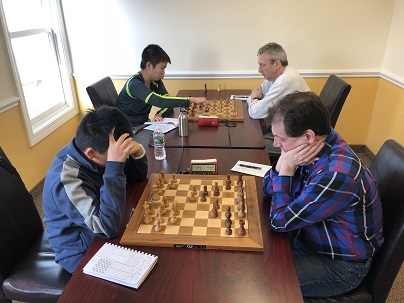 The first quad was won convincingly by Vincent Tsay who earned victory with a perfect 3/3 score! The second section was a six player swiss with all players ranked within 200 points of each other. There were few surprises in quad two as top seeded Andrew Dexter earned first place with a perfect 3/3. Today was a day of perfect scores as Aurelius Mlynar and Max Ingargiola both also notched perfect scores in their respective sections. Quad five was won by Ramesh Abhiraman with 2.5/3. Finally, the sixth quad was won by Zach Thayer with yet another perfect score of 3/3. Congratulations to all of our winners and thank you to everyone that joined us!